While the final fight card for UFC 170 bears little resemblance to the various iterations that existed prior to this point, there is still an event taking place tomorrow night at the Mandalay Bay Events Center in Las Vegas, and that means there are still predictions to be made. JUDO vs. WRESTLING — Here is the UFC 170 Crystal Ball Prediction. Much like last month’s championship fights at UFC 169, Rousey is in that “until she gets beaten, you can’t pick against her” territory, even though McMann has the pedigree and potential to upset the champ here. Part of what distances Rousey from McMann here is that the champion has shown her development and dominant talents recently—eight weeks ago to be exact. Her hands have improved and her grappling is elite, and while McMann also boasts tremendous grappling skills, we haven’t seen her since April and there haven’t been the same kind of dominant efforts from the Olympic silver medalist to this point as we’ve seen from Rousey. This will probably be a close, technical fight, largely contested on the ground, and in the end, that favors Rousey. The submission streak will come to a end, but the winning streak rolls on. McMann crumbled, clutching herself in pain. Referee Herb Dean stopped the fight on the spot, possibly a bit too early, but that was ultimately of little consequence. 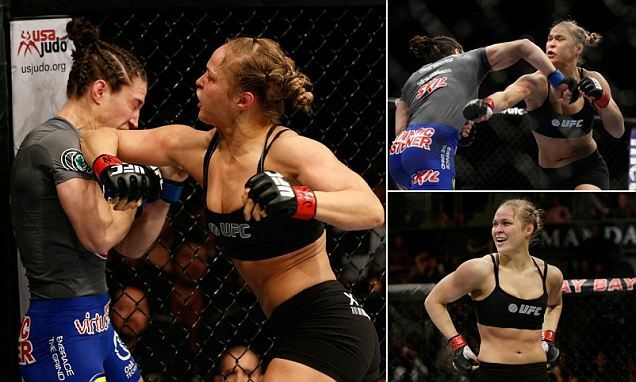 Rousey earned the win, and not just any win, but her first-ever TKO victory. By doing so, Ronda Rousey taught the world a lesson. Not only is she as good as advertised, but there isn't a single fighter in the UFC that could hope to challenge her. UFC has an incredible lineup of fights and USA Judo's logo will be right alongside the mats for all the action starting 10 p.m.
“USA Judo is appreciative of the UFC leadership for providing us a platform to promote our organization and the development of Olympic judo in our country,” said USA Judo CEO Jose H. Rodriguez. Headlining the evening is Ronda Rousey vs. Sara McMann in the Women's Bantamweight Title Fight. Rousey won a bronze medal at the 2008 Olympic Games in judo. McMann won a silver medal at the 2004 Olympic Games in wrestling. Go to www.ufc.com for info on how to watch. Look for the judo takedowns in the cage, look for the “USA Judo” logo in the Octagon.